Thanks Ed and Leah! It was a pleasure working with you. Thanks for letting us be a part of this beautiful project. Thanks Richard and Mary! It was a pleasure working with you. I think your pool turned out beautiful! Thank Merit Landworks! It's always a pleasure working with you. These guys are 'THE Best'!! Thanks Tom! It's always a pleasure working with you. I think your spool turned out great. You came up with a creative design. Thanks Chris and Kris! You guys have great designs and it was a pleasure working with you on this one. Thanks Tyler and Kim! It was a pleasure working with you on this awesome pool! 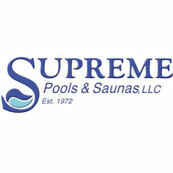 After getting pool/spa proposals from 5 different companies we decided to go with Supreme Pools. Thanks Gary! You guys are awesome. I hope you're enjoying your deep pool! Thanks Craig and Nancy. It was a pleasure working with you!